If you volunteer with the Foundation of Goodness (FoG), you will return home having had the experience of a lifetime. 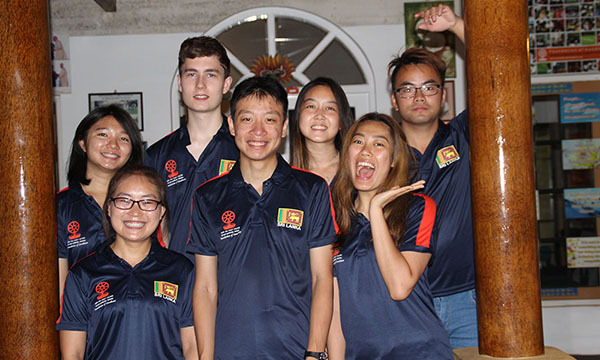 FoG hosts volunteer from across the globe – particularly since the tsunami – and the benefits for both the local community and volunteers are far-reaching. Volunteering at the Foundation of Goodness will give you the opportunity to bring much-needed skills to areas as diverse as sport, health, education, children’s wellbeing and more, directly benefitting people in the area who are disadvantaged by poverty and lack of opportunities. We welcome applications from all volunteers and are in particular need of well-qualified professionals who can provide insight and support for staff as the organisation moves toward a phase of community-focused development. If you volunteer with us, you will leave as a member of the family; most volunteers keep in touch, many continue to assist from afar in whatever capacity they can and some return again to enhance the work of the Foundation and improve the lives of the Sri Lankan people in this area. The preferred placement period is ideally 2 – 30 days. However, in the event we are able to accommodate you beyond 30 days we shall be pleased to oblige subject to extraordinary performance, discipline and value addition from our perspective unless you can present to us a specific action plan for which you require an extended stay. If you are interested in volunteering, please complete the Volunteer Form below and email to rashmini@foguc.org (Rashmini De Silva) and amaarah@foguc.org (Amaarah Kellapatha) along with your CV. Please carefully read all the points mentioned in the application form as well as on this page before submitting your form. Incomplete application forms will be rejected. The application form will help us to plan your placement and make sure that you are matched to the most appropriate project(s). We will revert within 7 working days with confirmation of placement as per your eligibility upon perusal and evaluation of your VAF and CV. Adult Volunteers (18 years and above): Please note that a mandatory Volunteer Administration & Services Fee of USD 25/- is applicable to all volunteers over 18 years of age. This contribution will help us to maintain the 30 empowerment sectors set up for the benefit of the less privileged rural community of Sri Lanka managed by the Foundation of Goodness, and special project costs associated with volunteer work programmes, such as environmental work, painting or children’s activities. This payment does not include accommodation and other living costs. Volunteers are required to pay for their own travel, insurance, accommodation and living expenses. Please note that in lieu of a volunteer placement fee is it mandatory for all volunteers to use Foundation of Goodness’ accommodation centres. Should you choose to opt out, you will need to pay a placement fee, the amount of which is dependent on the length of stay. The Seenigama Centres are operated through Tuesdays to Saturdays and closed on Sundays and Mondays. Exact working hours are not fixed and depend on the nature of work available at the time. Volunteers are expected to work on their own initiative and organise their own pattern of work. As a guide, office hours are 9 am – 5 pm but volunteers may be required to work outside of these hours with breaks during the day. “The Annual Pageant of the Seenigama Devol Temple (situated in the Ocean) takes place during the last week of August up to the first week of September, and this being a very important religious event with the involvement of the entire village, including all at the Foundation of Goodness, the volunteers are not able to give out their best during this period due to fewer activities. We recommend that this period is avoided unless you are interested in watching the pageant” which is also displaying our culture in a colourful manner, an exciting event of a kind. Obtaining a visa is your responsibility. Please contact us if you would like visa information. If you are interested in volunteering for longer than three months, there is a lengthy process to go through so it is important to contact FoG at least four months before you plan to arrive.